Try to visualise 200 million bottles. Too big to get a mental picture? Let’s start with just 1,000 then – how far the bottles would stretch if laid out in one long line. Multiply that line 200,000 times and the annual production of Spanish Cava giant Freixenet and its wholly-owned second label, Segura Viudas, is truly mind-blowing. Freixenet takes its name from the old family home of the Ferrer family, ‘La Freixeneda’, which means “where the ash trees grow.” Indeed one of the astonishing things about this enormous company – the biggest sparkling wine producer in the world – is that it is still owned by the Ferrer family. Freixenet’s huge facility in the small town of Sant Sadurni d’Anoia, just a few kilomteres from Barcelona, has the surface area of around 15 football pitches – but then it is also eight levels deep under the chalky soils of this corner of Penedes. 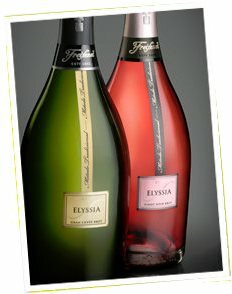 I visited Freixenet in 2010 to attend a special Cava and food-matching lunch, and also to celebrate the launch of their new Chardonnay and Pinot Noir-based sparkling wine called Elyssia. But Freixenet’s story was not built on these French varieties, but on the traditional local Cava grapes Macabeo, Parellada and Xarel.lo. Those are the varieties still closest to the company’s heart. As Graham Fortune, MD of Freixenet UK says, “We believe in the native grape varieties – if I go to Italy I don’t want to eat French, I want to eat Italian.” So the decision to make a cuvée from Pinot and Chardonay – both originally planted in 1991 for a still wine project – represents a big step for the company. 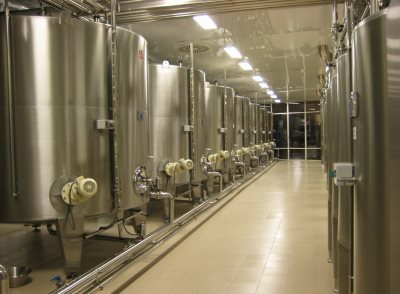 Freixenet has own unique yeast, reproduced every month from this laboratory (pictured left) to keep it in perfect condition and avoid mutations. The realities of a 200-million-bottle production hit home when you see this extraordinary facility that services just one small, but vital part of the operation. As with Champagne, yields are high as the base wine needs to be quite neutral – around 10 tons per hectare. The Pinot and Chardonnay are harvested first in early August, picked by machine and pressed at night when the temperature cools. Harvesting of the indigenous grapes begins with Macabeo at the end of August – the grape giving acidity and finesse – followed by Xarel.lo which gives structure and body and then finally, Parellada with its naturally lower alcohol. Freixenet carry out two pressings: the first gives the finest juice for premium products, the second at stronger pressure gives very good juice, but the remaining juice from further pressings – around 40% of the grape’s volume – is sold off. Cava has lower acidity than Champagne, so the dosage added to sweeten the wine after disgorgement is normally a little lower than in Champagne. I was surprised when Graham Fortune named France as the fastest-growing market for Freixenet Cava, where it is stealing market share from the AOC sparkling wines – crémants, etc. The UK remains a hugely important market though, where – excluding Champagne – around 55% of all sparkling wine sold in retail is Cava and where volume is growing 5% per annum. “Until now the natural barrier for Cava has been £10,” says Graham, “But with Champagne getting cheaper and many of the £15 bottles disappointing, we think there is a gap for Cava.” At £17.99 that is exactly where the new Elyssia cuvées are pitched. This tasting covered both Freixenet’s sparkling wines (including the new Elyssia cuvées of course) but also some still wines from their operations in Rías Baixas, Ribera del Duero and Priorato. See all stockists of Freixenet on wine-searcher.com. See all stockists of Freixenet on wine-searcher.com.